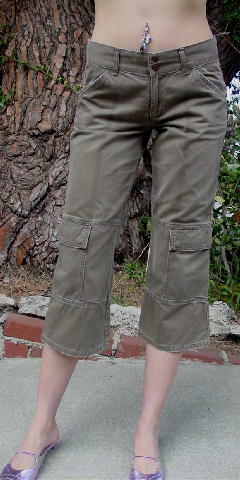 These low waist, flare cargo capri 100% soft cotton pants were made in Turkey by Mavi. 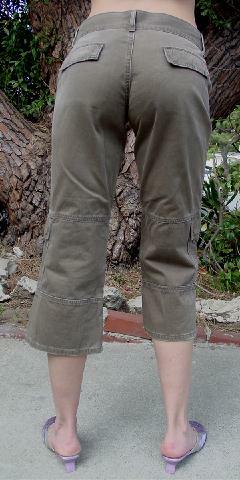 They have a 3 1/4" long zipper fly, a 2" wide waistband, and two antique copper logo buttons. There are belt loops and two angled top front pockets, and two lower front to side leg pockets with two hidden snap closures under the flaps. The back has two flap pockets with two hidden snap closures under each flap. The leg bottoms are starting to get that "well-loved" look. The tag says 27 and 914 Hazel. We think the color looks like a khaki-light olive. There are two rows of vertical accent stitching on the leg fronts.